United Supply Company and The Triangle Chapter of the WCAA welcome Sarah Devaney-O'Neil of Storibook Designs. Sarah will be speaking on Messaging, Marketing, and Media during the morning session and Textiles and Fabric Coordination in the afternoon. 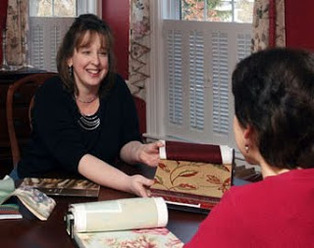 If you own a small business which focuses on the custom home furnishings industry, we would love to meet you. Join us for a day packed with useful information for your business and a chance to chat with like-minded folks. If you are new to the area, or hoping to meet others with similar interests, whether in the design end or the fabrication end of things, we would love to meet you. All are welcome. To Register -- if paying by credit card, please fill out the RSVP form and then choose a payment method. If paying by check please fill out the RSVP form below and mail your check to our Chapter Treasurer: Lisa DeVita, 1406 Doris Circle, Greenville, NC 27858. Don't forget to bring your scissors and knives that need sharpened. Norm of Diamond Sharp Shears will be on site for the day.